I love how shiny it is! Very cool. I've always wanted to try a jumpsuit, but I've never been brave enough! I'm scared it will make my hips look huge. I can't belive that those sky-high heels are comfortable, but they look wonderful! i just got my jumpsuit today and will be posting pictures soon. I really like that it has pants intstead of shorts! And those are some killer heels!! i am so ultra jealous of that jumpsuit! i'm totally loving jumpsuits right now. i don't care if they make me look extra short. haha. i just love them. have yet to find one made of really comfy material like yours. you look faboo! wow, gorgeous outfit and i llllove your shoes!! Wah I love your outfit !!! Oh that fabric is so cool! and those shoes - I die! for now i just love stella's jumpsuit. and maybe topshop for chepaer version. ooo shiny! i love it! goes so well with the shoes too. and dont worry about the chip. its not noticible at all! I LOVE payama moment! Gorgeous! veryy cool! i need to buy myself a jumpsuit asap! Some of my best shoes are chipped too. This outfit is ferosh! visit back my blog, dear..
loving your jumpsuit! 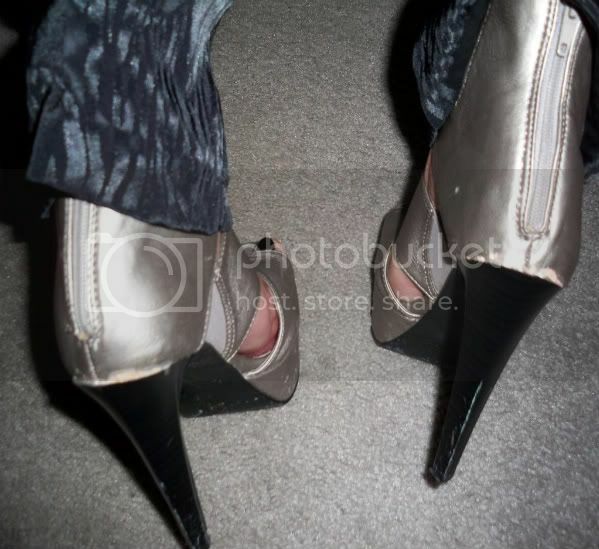 i can't wear too high heels..but what you have are cool. jumpsuits are fun. i've yet to find myself an awesome pair. I love this total look. Love this look! Great shoes.